How Do You Solve a Word Problem Using Two Equations? Sometimes word problems describe a system of equations, two equations each with two unknowns. Solving word problems like this one aren't so bad if you know what to do. Check it out with this tutorial! How Do You Write an Equation from a Word Problem? Having difficulty turning a word problem into an algebra equation? Then this tutorial is for you! With this tutorial, you'll learn how to break down word problems and translate them into mathematical equations. How Do You Simplify an Expression? 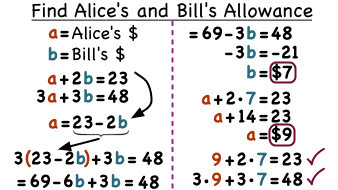 Simplifying an algebraic expression is a fundamental part of solving math problems. Get some practice putting an expression in simplest form by following along with this tutorial. How Do You Solve Two Equations with Two Variables? Trying to solve two equations each with the same two unknown variables? Take one of the equations and solve it for one of the variables. Then plug that into the other equation and solve for the variable. Plug that value into either equation to get the value for the other variable. This tutorial will take you through this process of substitution step-by-step! How Do You Solve a More Complicated Interest Problem? Looking into investments? Are you already investing? Then this tutorial is a must see! Follow along as this tutorial goes through a word problem involving simple interest. What's a System of Linear Equations? A system of equations is a set of equations with the same variables. If the equations are all linear, then you have a system of linear equations! To solve a system of equations, you need to figure out the variable values that solve all the equations involved. This tutorial will introduce you to these systems.